Each month Mary will pick one child to be Dancer of the Month and Dan will pick one child to be Tumbler of the Month. From these, one Dancer of the Year and one Tumbler of the Year will be chosen at the dance recital in May. The student must be at least ten years of age. The student must have good attendance and attitude. The student must show improvement in skills and signs of home practice. The student must dress properly for class. A child may be chosen only once in a school year. The student may be Dancer of the Month and Tumbler of the Month in the same school year. Those chosen cannot be teachers but may be demonstrators, aides, and/or teaching assistants. The student’s picture is displayed in the studio. The student’s name is in the recital program. The student becomes eligible for Dancer or Tumbler of the Year. Mary’s mother, Lydia M. Moritz, passed away in March, 1999. Lydia was a lifelong advocate of the arts and because of her dedication to Mary’s arts education, Mary set up a scholarship in her name. Each year at the dance recital Mary announces the recipient for the next year. The student must be at least ten years of age and a dance student at Merrilee Studios for at least the two preceding years. The student must be a serious ballet student. The student must have good attendance and attitude and show respect for the teachers. The student must show signs of home practice and an improvement in skills. The student must show the importance of dance in his/her life. The student must submit a written composition during the month of April stating why he or she should receive the scholarship. If those who apply for the scholarship are not considered to be ready for this commitment, no scholarship will be offered that year. 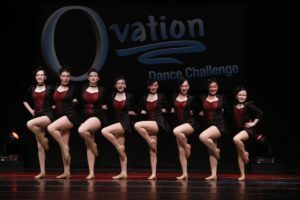 The chosen recipient is expected to take classes the summer before the scholarship year and will receive ALL dance classes for the next school year free of tuition. This is a $2000-$2500 scholarship. If your child is interested in this scholarship, he/she must work for it throughout the year. Mary’s father Edmund F. Moritz passed away in November, 2003. Mary’s mother may have taken her to all her classes, but her dad paid for them and her many costumes. In his memory, Merrilee Studios offers an award to be presented each spring at the dance recital. This Award provides the family with $200 worth of costumes to be used in the following year’s recital. The children in the family must have taken classes in the studio for at least one year including summers. At least one child in the family must also take 3 or more dance classes during the award year. The parent of the child applying for the award must write a short essay telling why the award would be helpful.